Been working on my arm meat (lifting weights). Really, more concerned about getting some weight bearing exercise in, so I don't get osteoporosis. A little embarrassing to only be pressing 25 pounds. Did not have a good night of scrapbooking on Friday. Completed no pages. I did use a heavy duty die cut machine to cut pictures into puzzle pieces but then they didn't really work as well I hoped. I worked on Nephew's Oliver! pages but am not really pleased with them. Joakim Noah has a ponyhawk thing going. Pat and I are duking it out for tournament points in the Florida vs. UCLA game. The boys teams have all been eliminated. Somehow I ended up losing the family NCAA tournament even though I had one of the last teams left standing (UCLA). Florida looks really good, and Ohio State does, too. That should be a good game. I'm posting some pics of dinner tonight. We had our friends Grace and Toru over along with my parents. International students are sometimes advised to take on an American name when they come over, which Grace did. Toru's moniker, Bruce, never caught on, however. Grace brought Joutsa's (my own spelling) with special sauce, which were delicious. I prepared Crab Stuffed Chicken Breasts this morning with asparagus, rolls, salad, etc. Dessert was not birthday cake as we are half way between Mom's and Pat's birthdays, but some Midwestern potluck dessert called Pretzel Salad. Salad, ha! Crushed pretzels with a quart of butter and sugar for crust, a layer of cream cheese/whipped cream and more sugar, followed by strawberry jello with frozen berries mixed in. After dinner, Boy14 serenaded us with Seven Nation Army and Wolfmother selections on bass guitar. Still time for some batting practice after that...I think the early Daylight Savings Time, or is it the end of DLS, is working out well. 2. someone telling me today, "no one can steal your joy"
We had something of a hair crisis last night when we tried for some bargain haircuts at a friend's house. A dude named Julius was cutting hair for ten bucks so we thought we'd get the boys taken care of. It's getting very difficult to even schedule a regular appointment with school, work, track practice, guitar, Scholastic Bowl, baseball, etc. Nothing against Julius, but I don't think he cuts much white-boy hair. When I walked in and saw Boy14's hair, akin to early Beatles/Johnny Depp as Willy Wonka/Artie Johnson on Laugh-In, it was really hard to keep a straight face. When I asked for layering he said he didn't have "shears." Boy12 was really concerned about big brother going to school looking like that, assured him Dad could fix it by buzzing it off, chastised me for laughing in the car, and offered to enter the house first to tell Dad not to laugh. Dad had a wonderful solution, taking him to Wal-mart . I called to make sure they were still open and alerted them an emergency was coming in. When they got there, she assumed Boy12 was the emergency, and fixed his hair up a little, then went to work on Boy14. The results are pictured above. I didn't have the heart to photograph them pre-second haircut, not knowing everything would turn out okay. He would not have allowed me to publish it on the blog anyway, but it sure would be good for laugh now and then in the privacy of our own home. Suffice it to say, a lot of hair was shed, and I couldn't be happier. It may not be perfect, but I haven't seen these faces in ages. Now it's time to work on Boy18, who looks a little like Sanjaya. Tonight my sister and nephew are in town so we had dinner together at the Knights of Columbus fish fry. Afterwards, we went to my folks house to play games. The boys shot hoops outside for awhile and everyone was comfortable in the living room, so when they came in, I suggested staying seated where we were and play parlor games. This was a big hit at Adam's graduation party, and it went pretty well again. We changed it up and started with "Button, Button, Who's Got the Button," except no one could quite figure out how to play it. Next, we played "Hide the Thimble" with the button. This is where one person goes out of the room and you hide the button. When they come back everyone shouts, hot or cold as they get closer are farther to the button. This lasted for sometime and was actually challenging to Nephew7. As interest faded in that, Betsy suggested, "Light as a Feather, Stiff as a Board." This was kind of dumb, and illicted some hysterics by Nephew7 as he laid on the floor and four others lifted him with two fingers each. The boys were getting kind of squirrelly after a few rounds of that, so we played "Stone." Nephew7 stayed quiet 1/5 of a second, and I started kick boxing around Betsy in an effort to get her to laugh, and wound up getting myself and Grandma doubled over in laughter and in need of a Depends (me, not her). Since most of the family were still able to stay silent we started in with Charades. This went on with both good and lame charades including Sanjaya, Shrek, Willy Wonka, Sandlot, etc. Finally, just Grandpa and Boy14 were left in stone. Eli almost lost it when Nephew7 did his own version of beat boxing. Grandpa broke down eventually when Betsy made a literary gaffe, and he had to correct it. Found out Boy14 had a plan to call Grandpa's phone in the morning if the game was still on and try to get him to answer. It was an evening of old fashioned fun. I agree with Ginnie that Melinda has already been noticed by those that matter. Hadn't thought of it that way. My boyz were dissing my girl Melinda, and calling her a thirsty platipus, something they got off "The Soup." I do wish she would eliminate the look of being a surprised school girl. I think she is trying to portray a little more confidence. I learned a new term last night, Beat Boxing. I guess that's how it's written. Anyway, it's what Blake does, and it's getting a little annoying, like he can't control himself. My sister says "they" are calling the crying girl, Little Miss Sobshine. Thanks, Bets. She described her emotions as "anguished," perhaps her puppy died. We had kind of a good laugh over Idol tonight, which has nothing to do with the picture above. Actually I got home after 8:00 and watched the end of the show live. I saw a young girl bawling in the audience during Melinda's rendition of "As Long As He Needs Me." Since I was bawling, too, I didn't think much of it (I had recently seen "Oliver" if you remember, and I loved the music from it). I then saw the re-cap at the end so when I went through the DVR tape (?) from the beginning, I could just watch the ones of interest. The boys actually wanted to see Gina sing "Paint It Black," something they have on their Ipods. But I had to show them how awful Sanjaya was, although he was better than usual! And there was the same girl, crying and quivering for Sanjaya. They showed her about 10 times, then had him go out and hug her afterwards. Weird! Well, I hope to hear from Betsy on what she thought of the performances. Anyone else, too. Little Miss Sunshine is a good movie for anyone who felt their family was a little off-dysfunctional-weird. I enjoyed watching the family cascade from one disaster to another. Unexpectedly, it didn't turn out with a fairy tale ending. My only complaint was Olive's "fat suit". I'm 100% sure they put a pillow under her shirt, to add to the frumpiness factor. Completely unnecessary. Last week's American Idol, just viewed on DVR, was the WORST ever. I suppose I know now I am not a fan of Diana Ross. I thought the songs were terrible and were performed poorly, to boot. My actual favorite was panned by the judges, Chris' Sligh's update of Endless Love. #1 Boys trying on some kool cat clothes. #2 Blogging and relaxing, relaxing and blogging. Dig the telephone in our "boutique" hotel. #3 Carribean street performer doing his stuff. This is our last evening in New Orleans, on the Riverwalk? Street performers in the Big Easy mime as statues for money? Nick Fazekas fouled out in overtime but Nevada prevailed anyway? Bob Evans has a new menu and it is quite good (flounder)? Mississippi has security guards posted at rest areas 24/7? North Texas University players were seen walking down Bourbon Street before their game and may have caused their demise? Red Hot Chilli Peppers can be agreed upon by all ages in the car? When I listen to my Ipod, I expect "Mandy" to get stuck on the words, "uphill climbing, uphill climbing, uphill climbing" the way it did on my record in 1974? I got accepted to University of Illinois School of Social Work master's program? Staunton, IL doesn't really have a Casey's. Blogger does not want to cooperate and upload photos tonight, but I will jabber anyway. Pat logged 900 miles each way to and from New Orleans, and didn't let me drive a lick! Last night we made it to Festus, MO and couldn't help but make fun of the name (we were punchy). InFestus, infested with what?? Boy14 followed up with, "Can you get my BagDad?" Ok, not that funny, guess you had to be there. Boy14 asked today if we were eating dinner Grandma's and I said, "No, why?" He replied, "It's St. Patrick's Day." It has been a tradition for my mom to cook Corned Beef and Cabbage, some call it Boiled New England dinner, on Pat's Day. After staking out the New Orleans Arena (next door to the Superdome) for an hour this morning, patience was rewarded in the end. On our way back from Bourbon Street this evening and very near to our hotel, I spotted a bunch of tall guys in warm-ups, and signaled Boy12. He saw the Nevada logo immediately and sped across the street, so as not to miss the opportunity this time, to the Hard Rock Cafe where Nick Fazekas was gracious enough to have his picture taken and provided an autograph for Boy12. We're convinced he will make it to the NBA and do well. He has a new devoted fan regardless. He seems like a really nice guy, and humble. Doubt Joakim Noah would have been so accomodating, though who knows. Maybe he would've danced for us. We started the day at Cafe du Monde (seems like 25,000 steps ago--well it was). I can't say there is much difference between a beignet and a garden variety fried dough/funnel cake at any carnival or festival around the country. The chickory coffee was good and strong though. We then walked to the Superdome which was a little farther than it looked on the map (2 miles?). No one seemed to know anything about the NCAA practice schedule, or they weren't telling us. After finally convincing Boy12 to abandon post at the players entrance, we walked back for lunch at Jackson Brewery food court (renovated beer factory, reminded me of the Tivoli in Denver). The boys took in Ripley's Believe It or Not (and a visit with the world's tallest guy) while moi had a rest. Later a stroll through the French Market where Boy14 spent the money burning a hole in his pocket. Pralines for me!! Boy12 and I then sat through a pretty amazing street performance of the Calypso boys pictured above. $10 donation for white folk. Dinner at some Creole joint for some authentic cuisine followed by a walk down Bourbon Street. We had a sighting of the North Texas basketball team, which we didn't even know was in the dance. Where in the World is Nick Fazekas? Nick was spotted outside Bubba Gump Shrimp near our hotel about 8:30 p.m. with his Nevada teammates waiting for the charter bus. They are in town to play Creighton Friday night. Pat ran back to the room to get the boys but they missed him by a few seconds, boarding the bus. Boy12 was majorly bummed. The second guy is just a typical vendor on Bourbon steet. It's quite the place. Not necessarily family oriented or the best place for a prevention specialist to spend vacation. Spring breakers abound. Here is our carriage driver. He was a real cut-up. Showed us where Brangelina lives. He was really entertaining, lots of vampire stories and historical information. Drove a mule called "Shannon", yelled at cars and cab drivers, and accused the other carriage drivers of DWI, while he appeared to be the one on "purple drank." He let the kids drive the mule then criticized their abilities. He made the lady in front of me (pictured here) take photos of St. Louis Cathedral with sunset behind it, then chastized her for making it into a "photo shoot." Bourbon Street was just starting to come alive at 8 p.m., about the time we retired. Oh, by the way, the driver says "French Quarters," plural. I'm wondering which is right? He seemed to be a local who should know?? We drove 900 miles and all we saw is the lousy Mississippi River and threw ice at seagulls?? Just kidding. We arrived in NO around 3:15 p.m. but took awhile to find our way to the French Quarter and to our Historic hotel. Very tight quarters around here. Narrow streets, close buildings. NO ONE can give directions or seems to know where anything is, leading to some frazzled tempers, especially the people checking in at the hotel before us. Walked around a bit to get oriented and soak in the ambiance (beignets, beer and urine). Boy 14 wants to buy an alligator skull ($12.99) in the worst way, but we are holding him off for now. Found the Cafe Du Monde (3 blocks), street performers, and origin of the carriage rides. So far, no Brangelina sightings. The boys are looking for Joakim Noah, here for the NCAA 1st round games. Will post picture if we are lucky enough. We found a Walgreens and got the much needed Colgate toothpaste. Burt's Bees lavendar and mint, dirt colored vintage 2000 toothpaste didn't cut it. Must run now and brush teeth before dinner...more later, dudes. We are thankfully in an okay room in Memphis after driving 9 hours. I worked this morning, the reason for the late start. I had a new bunch of kids for their first anti-drug lesson, and it went okay. We're a little weary and a little crabby when we couldn't find our way to the Fairfield Inn (a reliable choice). The kids got a little freaked when Pat and I had words over a U-turn that turned us AWAY from the Fairfield. We landed at the Ramada, and already have had someone knocking at the door looking for Paul and Angie. We stuffed ourselves, literally, at Red Lobster in Cape Girardeau, MO. I feel like a pound of butter is coagulated in my upper colon. I am going to read a bit before bed, while Cal does push ups on the questionable hotel floor. Sorry for no exciting pictorials of Graceland, Jim Neeley's Interstate Ribs, or Darius Washington, Jr. Just the boys chillin' on the bed. Sports Center catching to do. Just a quick reminder that Spring is here, but winter was not long ago. I'm so thankful. It's about 60 degrees, my car is clean and ready for our trip, along with myriad other errands being disposed of. I only have "clean the bathtub" left on my to-do list, and it may or may get done. Right now I am methodically going through all my digital pictures and deleting unnecessary ones. Most I don't even want print copies of, but can't part with them either, eveb though I'm afraid they are going to jam up my laptop. I knew when I started with the digital pictures, there would be major drawbacks, but the good outweighs the bad at this point. I recommend enlarging the bird picture. This picture was taken for my entry in the Messiest Desk contest at our local newspaper. The prize was a free organizing session at your place of work. Needless to say I was too disorganized to actually submit my photograph, and I have to say the guy who "won" was way worse than me. I have to revise my assessment earlier this week of "The Kite Runner" after finishing it today. I was bored in places, but interestingly, when I would pick it back up it would draw me in again. I know I'm a little behind the times, the book was published in 2003, but I had it on my list of books to read a couple of years ago, if that counts for anything. Over Thanksgiving, my sister-in-law's boyfriend highly recommended it and that was the impetus to buy it for Adam for Christmas. Pat was the first to read it, me, second, and Adam has not read it yet, but I'm hoping he will at least start over Spring Break this week. I was also disappointed when I realized this was not an autobiography, and the plot became somewhat unbelievable. This all led me to make some negative comments. However, there was something haunting and redemptive in it. I also appreciated the complexity and fallibility of the characters, which I argued with Pat about. I also fell in love with the little boy who becomes a central character. It ended on a positive, if not ecstatic note, which was realistic. The story came full circle and I found myself looking back to find familiar scenes and phrases. I love the way the author wove "for you, a thousand times over" into the fabric of the story. Very nice. I recommend it. I was looking for some inspiration in my pictures, and found this. Frankly, I'm a little burnt out on writing. At work today, it was kind of nice because I had all day to catch up on stuff. Most of it was writing. Meeting minutes and articles for the newspaper on social hosting (adults providing alcohol to minors) and parental communication and monitoring. Easier to give advice than carry it out myself. Actually, I'm pretty happy with my parenting skills overall. This is the most complete room in my little dollhouse. My mom actually needlepointed the little welcome mat. I haven't put the kind of effort into it like I thought I would two years ago when I got it. I guess my girlhood dream should have remained just that. Since this picture was taken, this little living room contains a fireplace, a silver tea set and a kitten in a basket, thanks to some birthday gifts from Betsy. The other room that has gotten some attention is the attic. My plan is to have the kids sleep there. There are some miniature Cubbie pictures glued on the ceiling above where the beds will go. In the corner is a box of Christmas paper and ornaments. Spring break for the kids has officially begun. We are going to take off for New Orleans on Tuesday. Not too much planned, we have a room in the French Quarter. Most of my ideas center around food (Beignets at Cafe du Monde, Emeril's, Quarter Master Deli). Maybe a swamp tour, voodoo shop, visit with Brangelina at their new home in the French Quarter, and cemetery walk. Any other suggestions appreciated! Lost is such a weird show. It's playing in HD in front of me, and I can't get into it. American Idol, on the other hand, is THE BEST. Actually, when I DVR it, I can skip most of the singers who I think are mediocre and/or boring, and listen to my girls a couple of times over. There is one guy who is growing on me, they call him "justin timberlake." He did a cool song last week, something about a "freak". This week I didn't care for his Keith Urban impersonation. Better to spend most time reading. 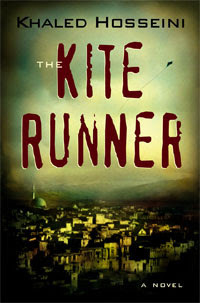 I'm trying to get through "The Kite Runner" though I'm finding the story too far fetched. I didn't really know anything about Afghanistan, other than they grow and export a lot of opium products, and the atrocities of the Taliban, especially with regard to women. So, I find any other cultural data very interesting. Now, to continue with the day. The boys got out on what was a very wet field, that froze over the last couple days. Good enough to skate on, until they started poking holes in the ice and the water erupted over the ice. That was it for our frozen tundra (I hope). Pat misses the ice, being a Buffalo hockey boy at heart. The groundhog said the spring would be early, and this is not early. I expect March to be much nicer than it has been so far. Mercury must be out of retrograde, as I am feeling pretty good now. I don't know what that is exactly, just that I was out of sorts, disorganized, overwhelmed, and had problems in general last week. The full moon has also passed, and we are into waning crescent as of this evening. I am busy doing laundry, exercising, studying for a statistics test tomorow, and squeezing in a little blogging (for a reward and stress relief!). Last night we saw the community theater production of "Harvey." This was all my kids, nephew, husband, sister. Everyone enjoyed it and found many parts uproarious. Elwood P. Dowd was played by a university theater professor. Just a really good performance, even if my dad thought he played him as something of a lech. I thought he was charming, poignant and yes, hilarious. My father played Dr. Chumley for the second time in his amatuer acting career, and Mom was Mrs. Chauvanet. She had previously played Myrtle Mae and Veta Louise, much meatier roles. I'll have to add here, the name of my blog was inspired by my idea of trying out for the role of Myrtle Mae a few months ago. I didn't know at the time, the character was in her twenties. Ha ha on pulling that off! Mom got the first big laugh of the show with her, "I thought you were dead" line. Dad was quite believable as the psychiatrist who begins to believe in the imaginary white rabbit who can stop time and take him to his fantasy of "Akron, cold beer and poor, poor thing." Not bad for a couple in their seventies. The play was an interesting take on the mental health profession of the 1940's. My how things have changed! Coincidentally, the movie version of Harvey was shown on TNT tonight. I have to say, Jimmy Stewart doesn't have anything on our Ray Gabica. He was a little too hapless for my taste. Just learned in the afterward, that Jimmy was not happy with his portrayal and thought it was not edgy enough. He later did it on Broadway and in a TV movie, a little darker and "crazier" and was much happier with the result. I would like to see that and become a real Harvey critic. I posted this awful picture in case Christina looked over here to see how great her birthday cake really does look. I picked up a store cake the night before and this is it practically demolished after the folks came over to help celebrate. The IPod is sitting on top of the clear plastic lid. Somehow, I thought it would look artsy, but didn't turn out that way afterall. I have already learned how to sync my IPod and added three CD's (Ragged's, Lucy Kaplansky, and Beatles Love) all by myself! It is so exciting to learn something new. I guess I will have to break down and buy some songs off ITunes, though I think $1 a song is ghastly. I haven't gotten to listen much as my sister arrived in town tonight so I didn't walk at the Y. I was listening and computering at work, and the boss walked in and startled the bejesus out of me. Guess I won't wear it at work anymore. Has anyone else found a laptop to be much more comfortable on one's lap than up on a table or desk? I'm only a little afraid there is radiation seeping out into my thighs, it gets really hot. We have a 14 year old in the house today. I tried to import one of his CD's to ITunes and my Ipod before he had even listened to it. He loves the Red Hot Chili Peppers. They are okay. But it was the Beatles CD I had heard good things about. For his birthday, he got Mom coming into his health class and teaching drug prevention. Well, at least it was the last time he will have to endure that. Hello Ipod. I have definitely not mastered the new toy yet. Not even close. I have to get one of the boys to instruct on every step. Then it looks so obvious. The clip is so handy, though. Really nice for walking. Too bad I only had four songs. The color is awesome, the boys love it. The picture doesn't do it justice. That was after deleting over 200 I found had been saved on my computer by Boy/man18. No clue who any of the bands (?) were. Chuck, aka Tag03, aka BIL, I wouldn't want to ruin Of Mice and Men for you, should you decide to watch or re-read it. Yes, I could see how it could upset a child or at least give them a creepy feeling.